All our depression and every crippling crisis in actuality is based on a facade. When God seems far away, removed, and inactive it is but a half-drawn picture that ignores the greater reality of God’s inescapable presence with us through all things. We doubt God’s presence while immersed in God’s presence. Sometimes, for His own sovereign reasons and sanctifying purposes, God suspends the sense of His presence, but never His actual presence. Forgive me, Lord, for my failing faith. Keep me. Awaken me to the reality of your presence and the riches I have in you. I ask this in the Name of Him who promised, “I am with you always” and “Never will I leave you; never will I forsake you.” Amen. June 22, 2013 / admin / Comments Off on He is Able! Here’s the basic truth about life: You can’t. But there’s good news: God can. You can’t … stop, overcome, compensate, quit, change, conquer, triumph, refrain, etc., etc.,etc. Clearly, you can’t. Otherwise you would. You would love to! But you can’t. But God can. You name it. God can do it. No, this is not a carte blanche kind of deal. God is able to do anything that He wills to do. But what is He willing to do? When and in what is God both able and willing? What will it take to see God do them? First, we have to admit that we can’t. We have trouble with this. We don’t like to admit this. This is humiliating. It seems to dash all our hopes. But it is essential. For as long as we insist that we can, God won’t. May we find the joy of discover just how able and willing God is to do through us all that He requires of us. Such joy begins with the crushing of self-hope: I can’t. It finds full flower in Christ-hope: But He can! He is able! 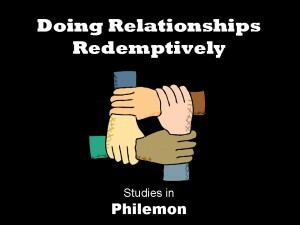 June 10, 2013 / admin / Comments Off on New Resources on Philemon! 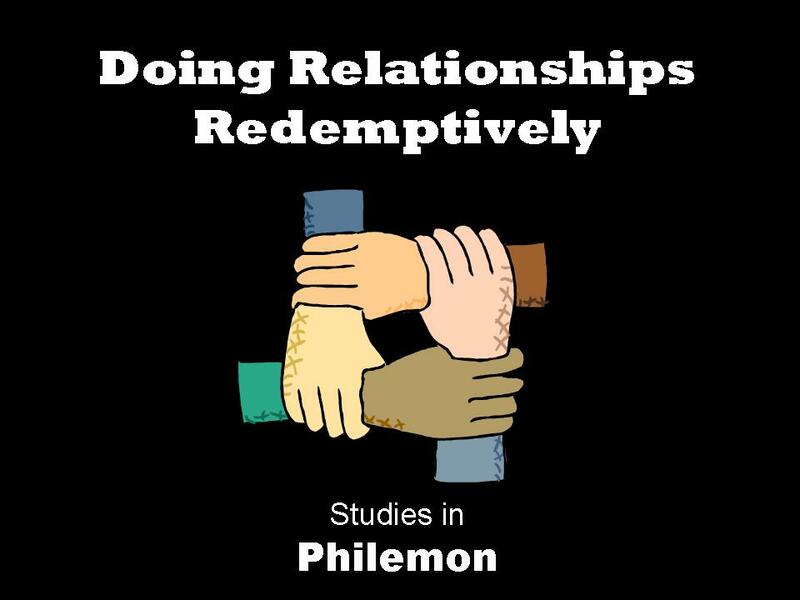 Over on the “Resources” page you’ll find the audio and .pdf files for a new series of studies through the brief, but profoundly powerful letter to Philemon. Our theme is “Doing Relationships Redemptively.” And isn’t there need for that in all of our lives? Happy listening and studying!